the writer is terrific,,, I would certainly recommend it." Boston. 1867. On the edge of the New World. Charles, a disgraced Englishman, is on the brink of making some alarming discoveries. New play that captures the spirit of the Wild West and the suspense of a murder mystery. An unforgettable cast of characters. Brilliant ensemble performances. 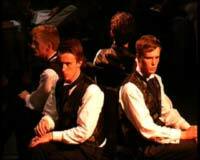 A sell-out smash at the Edinburgh Fringe Festival 2003, this is wonderfully evocative new writing. "Fantastic... Ben Woolf is so talented I want to slap him." "Western is absolutely terrific... exciting young theatre company with lots of talent... very funny... the writer is terrific... I would certainly recommend it." "Very interesting young company... loads of energy... very promising"
"Remarkable... Western is a beautiful playlet performed by four really impressive actors. A wonderful ensemble performance." "Cleverly composed ensemble piece... sharp, funny, truly a joy to watch... a subtle satire but a deft one that engages the mind and entertains simultaneously."